This article originally appeared in Arts Professional on Thursday the 14th of June. As a Catalan now living in the UK, outdoor work has always surrounded me – it has a central role in our culture and many successful and iconic Catalan companies have been touring the world since the 1970s. It was the democracy of public space that first drew me in, as well as the honesty and rawness of artists working in the sector. Based in Manchester, XTRAX is one of the founder partners of Without Walls, a consortium of 18 festivals and one creation centre spread across England. Its main aim is to support artists in creating and touring outdoor work. Although managing Without Walls is one of our biggest projects, another significant focus of our work is showcasing events, where we introduce the work of UK companies to a number of presenters, helping artists secure onward touring nationally and internationally. While there are several common challenges for both indoor and outdoor touring models, the outdoor touring model has some unique characteristics. Whereas venue-based seasons usually run from autumn to spring, the outdoor festival season takes place mostly from May to September in the UK (with some special events happening later in the year, such as light and winter festivals, Bonfire Night, Diwali, Christmas and New Year events). Some of the most successful companies can secure over 50 performing opportunities during this period, making these the busiest months of the year. Although many companies are working exclusively in the outdoor sector, it is increasingly common for artists (especially those working in dance) to combine both, therefore benefitting from the indoor as well as the European outdoor seasons. Examples of this would be Company Chameleon, Motionhouse and Stop Gap, who regularly tour outdoor festivals through the summer, complementing their venue touring at other times of the year. This is a financially beneficial model to any company employing dancers throughout the year. But how permeable are the borders between indoor and outdoor work? The outdoor sector has its own set of conventions, and the most successful work will do a lot more than simply transpose a piece of indoor work to the public space. Most outdoor events are free and unticketed and take place in a variety of settings, beyond the controlled environment of the black box. Moreover, and unlike venue-based work, where the work is rehearsed behind closed doors until the magic of the theatre lets one unveil a finished piece, outdoor sector shows typically need to be presented several times in front of an audience to find their feet. And while it is relatively uncommon for venue-based shows to have long runs (West End smash hits aside), successful outdoor shows can be kept in repertoire for numerous years. 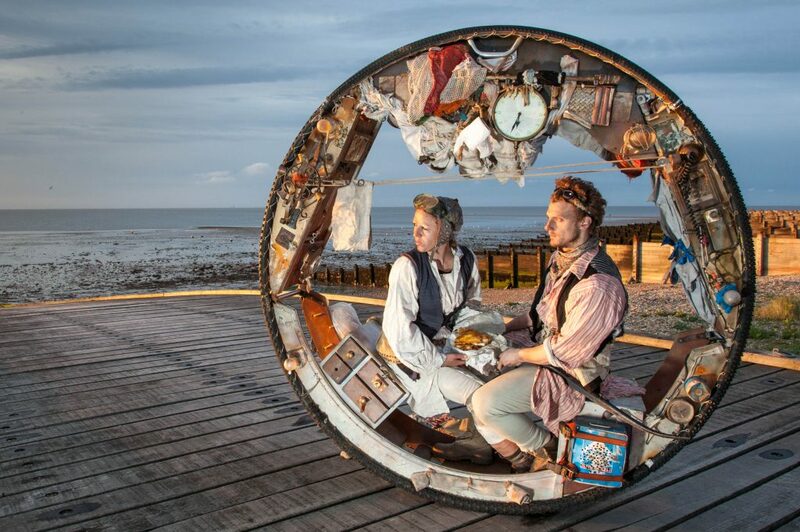 Shows like The Wheel House (2008) by Acrojou or As The World Tipped (2011) by Wired Aerial Theatre are still touring now to national and international festivals, and have clocked up hundreds of bookings between them. This is very much a particularity of outdoor work, reflecting the different financial models behind the presenters and the artists making the work. At an international level, these well-established, polished shows become flagships for UK outdoor arts, placing our artists in the global outdoor arts scene. At Without Walls we recognise the importance of touring in helping artists develop successful work and giving them presentation opportunities in their first year of creation. 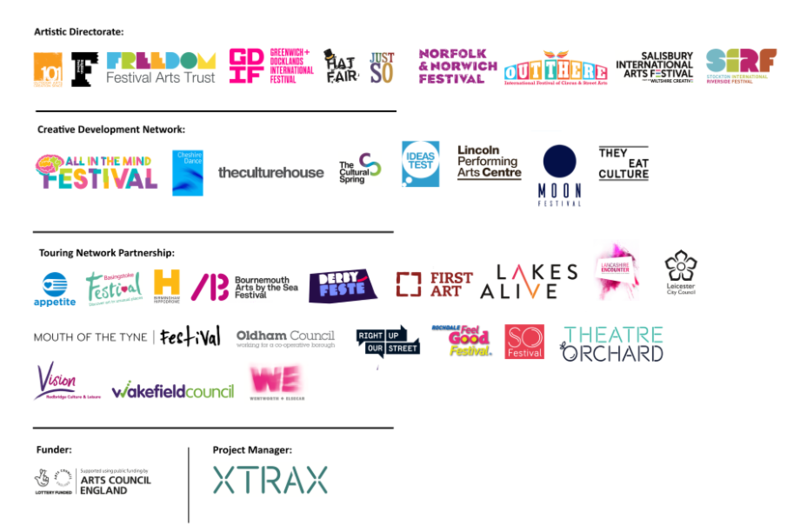 We also facilitate onward touring opportunities through our Associate Touring Network, a second group of festivals located in areas of low engagement for the arts. Another strength of Without Walls lies in the varied nature of its components, and the careful balance that is maintained between sharing programming ideas and maintaining each festival’s own identity. The festival partners understand the importance of growing the sector and are committed to doing so. A willingness to work collaboratively is key to fulfilling this need. The model has drawn attention from international colleagues, with festivals and networks from Spain, the Netherlands and Latin America looking at ways to adapt this model to their situation, which is sometimes defined by economic fragility. Furthermore, projects focused on supporting the export of UK outdoor work are key to ensuring wider touring opportunities for British companies. For artists, it is important to understand the intricacies of taking work further afield, and ISAN as well as XTRAX provide free online resources and links with useful advice on this topic. Having come from a country where precariousness is very present in the arts, it is refreshing to see institutional investment from funding bodies and collaborative partners giving sustained support to artists and consortia. This acknowledges the value and impact of high-quality outdoor work presented to wider and more diverse audiences across the country.